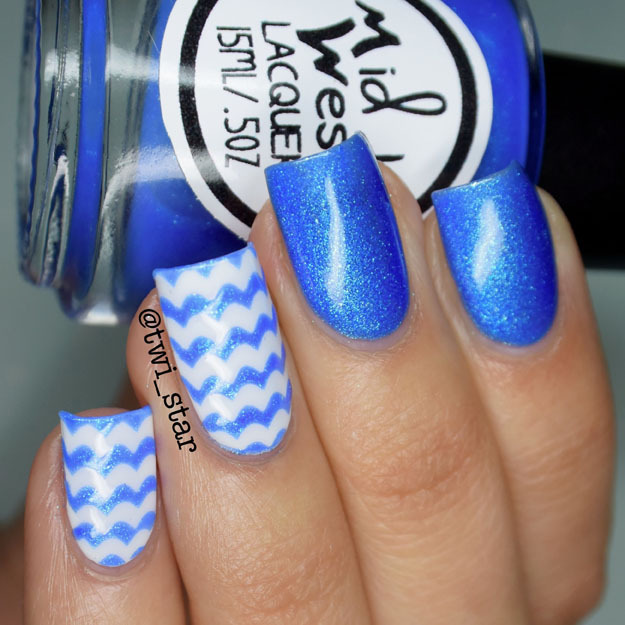 Today I’m sharing another thermal from MidWest Lacquer aka Vinyl It Up and this one is soooo BLUE! Love it. Part of the proceeds from ‘End NF’ will be donated to the Children’s Tumor Foundation, nice. I could have asked Lizzie what colors these would change to but I like being surprised haha Turns out this blue turns white so my design layered over white makes it look like the polish disappears! Not something I would have done on purpose but I think it is such a fun look, a happy accident. Ok let’s get to swatches! Here is how the polish transitions from cold to hot. Looks like icicle fingers! I’m thinking this polish would be perfect for a Frozen themed mani. ‘End NF’ is full of green / aqua shimmer and it also shifts from blue to pink ever so slightly! It’s not a strong duochrome but visible at certain angles and adds a little something to it. Formula was a little thick but I expect that for specialty polishes but it didn’t hinder application. Shown here with 2 coats and they flowed onto the nail nicely. For the wave vinyl accent nails, I painted 2 coats of White on White from China Glaze and used mini wave vinyls from Vinyl It Up. I love how ‘End NF’ looks over white, it really brings out the aqua shimmers. Tomorrow I’ll be posting the last of the 3 thermal polishes from MidWest Lacquer, thanks for stopping by! I saw this on IG last night. I love the thermal! Not a huge thermal fan, but the fact that this one turns white makes me happy! Thanks! I'm thought it was so cool! Thats gorgeous! I looove thermals that turn white! So gorgeous. As a major thermal fan this has my heart fluttering! So pretty, I love transition on this one! I agree the moment I saw the transition my thought was Frozen mani lol! Thank you! I wasn't the only one to think Frozen! Thank you so much! Now I do too! What a stunning thermal! Love that shimmer it has to it. This is amazing! 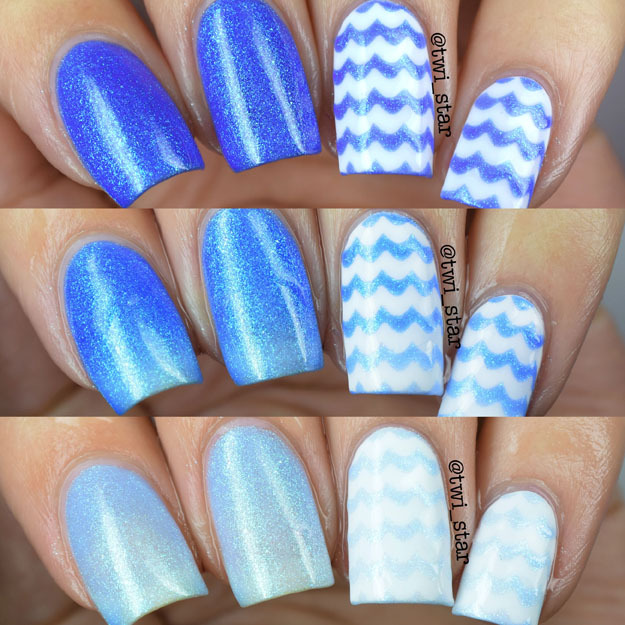 Love thermals, love blues, must have! Blue polish is one of those colors that just makes me happy to wear! Thank you! I'm not usually a fan of thermals, but this one is gorgeous!!! Love all of this! The color, color change and nail art...just perfection!